Like so many other U.S. cities during the post-war era, in the late 1950s and early 60s a great portion of Memphis’ population was migrating away from the city’s downtown core. This was the era that gave us the term “White Flight.” In Memphis this migration would eventually establish sprawling suburban neighborhoods in East Memphis, Cordova, Germantown and Collierville. Increases in inner city crime, and the fears permeated by the unrest of the Civil Rights Movement and the 1968 murder of Dr. Martin Luther King, Jr. on the balcony of the Lorraine Motel only exacerbated the migration, and would eventually turn parts of Downtown into a ghost town. It was a time of transition, as new and young “pioneering” couples began to gamble on home purchases and renovations in a part of town that, though aging, had not suffered the ravages of decay and urban blight seen in other parts of Memphis. Here, most of the Crump-era mansions and estates were still standing, but were increasingly seeing old Memphis money being replaced by young families seeing bargain prices and seeking a sense of community. And yet there were looming threats, from banks that envisioned a future of boarding houses and duplexes, and developers that were planning high-rise apartments. The late 60s was a time of brewing activism and adventure in Midtown, Memphis, as the fight to protect nearby Overton Park from the development of Interstate 40 would be heating up soon, and when a group of investors began looking at the old store fronts at the corner of Madison and Cooper with dreams of turning it into a new town square and starting the first TGI Fridays this side of New York’s Times Square. In that spirit neighborhood residents - led by Drew Canale, Joe Tagg, Jr., L.K. 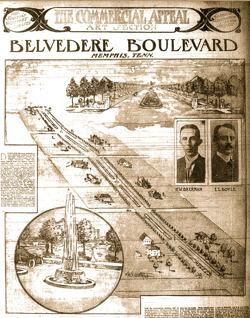 Thompson, Jr., Hallam Boyd, and Mrs. Robert Shafer - rallied to defeat the plan to defile Belvedere’s pastoral median. Yet more proposals for undesirable development on the heals of that defeat served as a wake-up call to the neighborhood. Despite the obvious benefits of such improvements, there were dissenters who threatened to keep Midtown and Central Gardens from becoming what it is today. Also reminiscent of today’s efforts, not every resident saw the benefits of these plans; rather, a few individuals argued that improvements and zoning changes would price out those with moderate incomes, and that Midtown should continue to be appealing to working people. Their arguments and Pollard’s improvement plan would be taken to the City Council and the Planning Commission for a hearing in November, 1975, and would prove a turning point in the burgeoning renaissance of Central Gardens.